It’s still there. Why doesn’t the city just bronze this pile and make it into a permanent art display? You would think a New York Yankee fan would be motivated to clean up this fossilizing mess. Why bother with a trash bag when there’s a snowbank out front? All images taken 1/21/08 from 2:49 to 3:05 PM at various spots on Cornelia and Elm streets. In Plattsburgh, NY (Where else?). A cavernous three-story bank lobby as a recording studio? It works for composer/musician Adrian Carr. 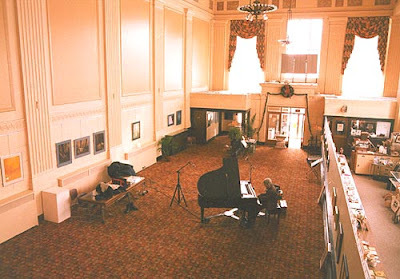 He's been recording his next CD inside the Old Merchants Bank in downtown Plattsburgh. He likes the echo effect created by the vast walls and ceiling. 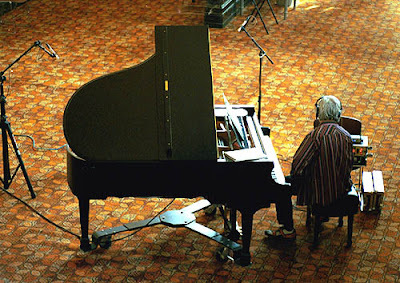 To control the effect he places his microphones at various distances from the piano. Built back in the 1920s, the bank now houses the offices and gallery of the North Country Cultural Center for the Arts (NCCCA). Beside a variety of art exhibits, the “Arts Bank” (to use its nickname) has also hosted live musical performances and ethnic-themed banquets. Both faces of the antique-style clock on Durkee Street. Each image was taken within seconds of each other around 3 PM. So which wrong time do you prefer? Time doesn't fly with hands frozen dead. Just another example of a waste of time and money – taxpayer money, that is. Are more people coming downtown to look at antique clocks and lampposts? The City of Plattsburgh has misspent money on the old-fashioned look. A vehicle just bumps into one of the lampposts and it snaps off. And this clock also evinces second-rate quality. How many times has it been fixed? But unlike Plattsburgh, each face of this clock is right at least two times in the same 24-hour period. Warm air has done more to clear sidewalks blocked by snow than the apparent hot air blowing from city hall. I give thanks to the January thaw. Over two weeks ago I called the building inspector’s office and provided a short list of problem spots. The guy on the other end told me that it would be a while before appropriate action would be taken. Last winter part of the sidewalk on Elm Street was a problem. Two storms and it was never shoveled – until I contacted the city. Then it was cleared. This winter, same problem, but not the same result. Until recently the last half of Elm Street that runs into Miller has been blocked, lost to view. The property owners clear their driveways and walkways into their buildings but do nothing to shovel off the rest of the sidewalk. So far only warm temps have uncovered the concrete buried underneath. At least the property owner on the other half of Elm has done his part. But it must be annoying to see the scofflaw next to him ignore the new law. Or is the new law in effect? Maybe I missed the announcement, but I didn’t see any mention that the NY Department of State approved it. Years ago mayor Dan Stewart was blowing hot air about hedges being cut back so that they wouldn’t obstruct the sidewalks. It was implied that the city was going to take appropriate action against property owners responsible for the untrimmed shrubbery. That causes one to wonder: is the city bluffing with unshoveled sidewalks? But at least it could set an example and shovel out the school crosswalk on the east side of Margaret Street. Kids are still climbing over the snowbank so that they don’t have to walk in the street. And, yes, I told the city about that problem over two weeks ago. Someday the world will cease to exist. Poetic eschatologists debate whether it will end in fire or ice, with a bang or a whimper. Me, I think the world will end in a long sigh of dust. Usually the coldest days hit after the winter solstice. On a clear day most of the heat – what there is of it – radiates from ground level into outer space. But if clouds roll in and the sky is overcast, then some of the rising heat is bounced back and held down, resulting in warmer temps. Thanks to radiational cooling the North Country ends up with cold sunshine to accompany the snow and ice. Over two weeks later and it is still there on a main street sidewalk. And if you don’t know what “it” is, check out the previous Dog Watch post with photo image. Clue: “it” ain’t a rose. Before he left office Plattsburgh city councilor Bill Provost decided to let a couple of local journalists know his displeasure regarding what he perceived as their lack of professionalism. At his final common council meeting last month he proposed a resolution to name the municipal sewage treatment in their dishonor. Of course, his proposal was easily defeated. The journalists in question, Joe LoTemplio, Press-Republican newspaper, and Ducky Drake, WIRY Radio, each missed out on his fifteen minutes of fame. Therefore, at least at this blog, the sewage plant will now be known as The Ducky Joe. I called a while ago and so far no action by the city. OK, I know Public Works Department is stretched thin and can’t cover everything ASAP. But after so many empty promises, cynicism starts to kick in; there’s the feeling that the scofflaws will skate through another winter without any repercussions. Most property owners are doing their part but a few just don’t get it. Three storms and this section on Elm Street is still clogged, except for the driveways and sidewalks leading into each building. Elm is a narrow street, just enough room for two cars traveling in opposite directions to pass each other. Drivers don’t need a pedestrian in the road. Of course, the issue about senior citizens and the disabled being unable to shovel is an issue, but one that is being addressed, in part with volunteers. Anyway, raising money by getting scofflaws this way sure beats towing vehicles on New Year’s Eve because of the after midnight parking ban during a snow storm. With school starting up soon, will the city ever clear this part of its crosswalk on Margaret Street? Or does it want the kids to walk in the street or scale the snow bank? If Plattsburgh truly cares about the environment, besides thinking green, it should also think brown.